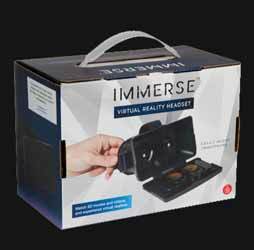 For those that are keen to experience virtual reality without breaking the bank, the Immerse: Virtual Reality Headset ticks all the right boxes. It's a well designed, solidly constructed headset that allows you to slot your smart phone inside securely and experience a taste of the future... and, more importantly it's cheap as chips. Obviously this item is only a vessel to hold your smartphone. It's adjustable to ensure that it can incorporate most models easily and securely. Then all you need to do is download some software (there are loads of games and movies on the app stores) and away you go. To get started, and experience 3D movies, simply type "Side by Side 3D" into YouTube and you can engage in a little 3D magic. 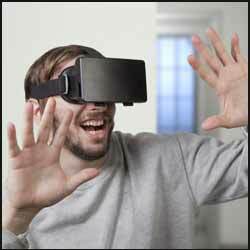 In addition there are games and Apps that make use of your smartphone's movement so that you can experience a virtual reality world where you can look all around your environment. It's comfortable and easy to attach to your head, thanks to the adjustable elasticised straps and thick foam that is designed to protect you from the hard plastic. You can also move the lens to ensure that they fit your eyes exactly. The only slight issue (and this won't be a problem if you're not a bumbling buffoon) is that the smartphone isn't overly secure once the headset is closed. If you try to adjust the headset while wearing it and accidentally push the button on the top (which is practically impossible to do), the front of the headset will fall down and your phone will tumble out. As I said, you'd have to be a total idiot, but it is worth making a note of where the button is. 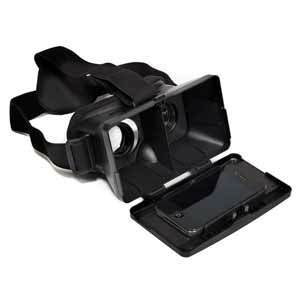 The lenses give an ultra-wide field vision and amazing 3D view which you control with your head motions. It's practically a necessity for every tech-head out there.